Talk about responsiveness! 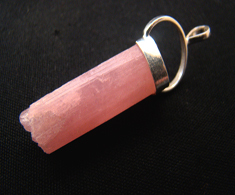 This beautiful little pendulum is quick and nimble in delivering its responses. The workmanship is impressive and the kyanite gem itself is just striking. At first I thought this pendulum felt a bit lightweight, but the moment I held it and did my first query, any reservations evaporated. It began moving smoothly and in a wide arc, so I had no doubt about the answer. I'm so pleased to have found Divining Mind and am impressed with the quality of items the owner Chris has assembled. Thank you!